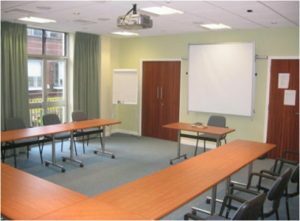 This training room has excellent audio-visual capability, WiFi access and a kitchen en-suite. It is located on the first floor, and is accessible via lift, or stairs. Users have a choice of air conditioning or natural ventilation, and may select from a variety of room layouts. A ceiling mounted video/data projector with a large rail mounted screen is provided, and sound reinforcement is offered via a boundary microphone system with induction loop deaf aid support. A TV connection with all Freeview channels may be displayed via the Projector, and the DVD/VCR combined player may be remotely controlled. The en-suite kitchen is provided with a work top and cupboards, refreshment trolley, cups, saucers, plates and cutlery. It is 3.3 x 2.7m in size.